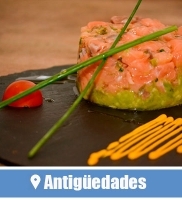 (Leer en español) Catedral Bar is an historic bar in Seville housed in a building of 1923. 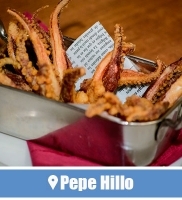 A traditional restaurant, with an unbeatable location, careful decoration, excellent service and an extensive tapas menu. 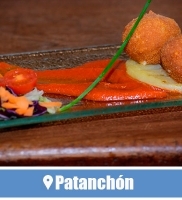 Catedral Bar is in Mateos Gago Street, the most important gastronomic street of the city. 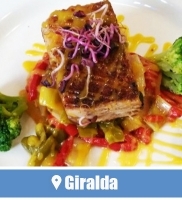 Next to the temple that gives it its name and with magnificent sightseeings of the Giralda, it is already a classic of sevillian tapas. 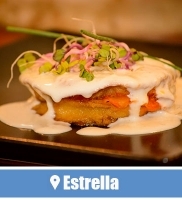 The meeting place between Sevillans and tourists eager to know the local gastronomy, is an obligatory stop in the historic center of Seville. The ideal starting, arrival or rest point when you decide to enter to the district of Santa Cruz. 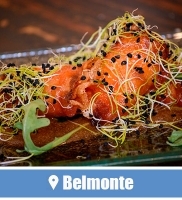 Catedral Bar stands out among the rest due to the work of a committed team. 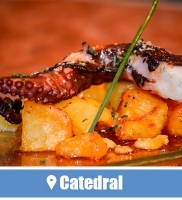 Catedral Bar has obtained in 2018, for the fourth consecutive year, the Certificate of Excellence on Trip Advisor thanks to the opinions of satisfied customers. 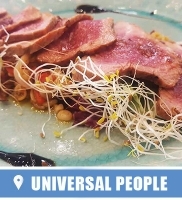 In addition it has become one of the best restaurants in Seville for to know the gastronomy of the city, Andalusia and Spain in the form of tapas. The decoration is an homage to the history of the own bar house. It retains elements that evoke its former era as an antiques shop. The bar preserves part of the elegant essence of the piano bar that was and the echo of that jazz is kept in its walls. Its bullfighting atmosphere is joined to complete a purely Sevillan environment. The beams and finishes in wood, joined to the French style lamps, provide a delicate distinction, especially pleasant for family or friends lunchs and romantic dinners. 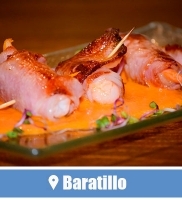 There are several options for the visitor to Catedral Bar. 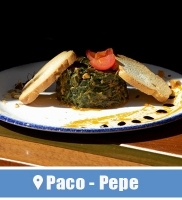 You can enjoy the traditional tapas in the wooden and marble bar counter or in the small tables of the main saloon. If you go in group, they will facilitate you the access to a bookings area in the second floor. Finally highlights the magnificent atmosphere of the Catedral Bar terrace. The good weather in Seville allows to enjoy terraces during all year. Is better when its has water nebulizers to generate an ideal microclimate in summer. Thus the passage of pedestrians, the life that fills these sidewalks and the spectacular sightseeings of the Giralda and Cathedral, turn these moments into magicians. 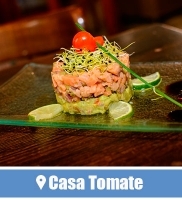 Catedral Bar offers the warmth of traditional cuisine and adds a touch of personality to its tapas. 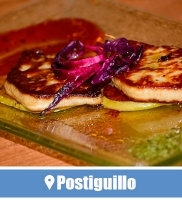 A generous variety of Andalusian food, made with fresh produdcts from this area. 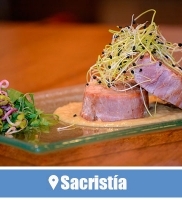 The cuisine, directed by the chef Emiliano Sánchez, starts from the traditional recipes to take a turn and approach the culinary vanguard of the Spanish gastronomy. Fried fish, typical seasonings, stews, meats and seafood with an original presentation. 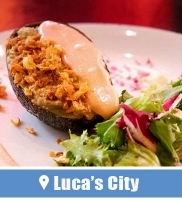 You can taste the traditional food or try new sensations with unique tapas in the city. In addition, Catedral Bar has an excellent selection of Iberian sausages and a wide list of different variety and origin Spanish wines. 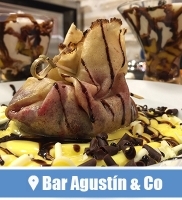 You can find out more information and book at Catedral Bar on their website and on the Facebook page.